My five-year-old daughter Sophia is L.O.L crazy, she has been collecting L.O.L dolls for the past year getting them for her birthday or spending any money she has on them, she even spent her holiday money on when we were in Majorca earlier in the year! So it is no surprise that even more L.O.L Surprise dolls are on her Christmas list this year. She loves the surprise element of them and all the fun accessories that you get with the dolls (and pets), however, as the dolls and accessories are so small she often ends up losing the shoes and outfits for them. 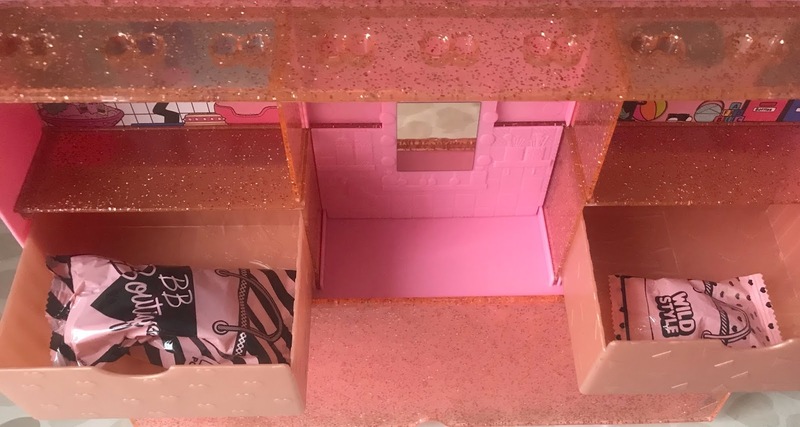 So when we were offered to review the new L.O.L Surprise Pop-Up Store Playset I thought that would be perfect for her to store all her L.O.L dolls and accessories in. I had previously seen this playset in a shop and wrongly thought it was just a display case for L.O.L dolls, however, I was wrong as not only is it a display and storage case but it also turns into a little playset and you can also use it for transporting dolls too. Of course, as soon as the L.O.L Surprise Pop-Up Store Playset arrived, Sophia was super excited and couldn't wait to see what was inside the box! 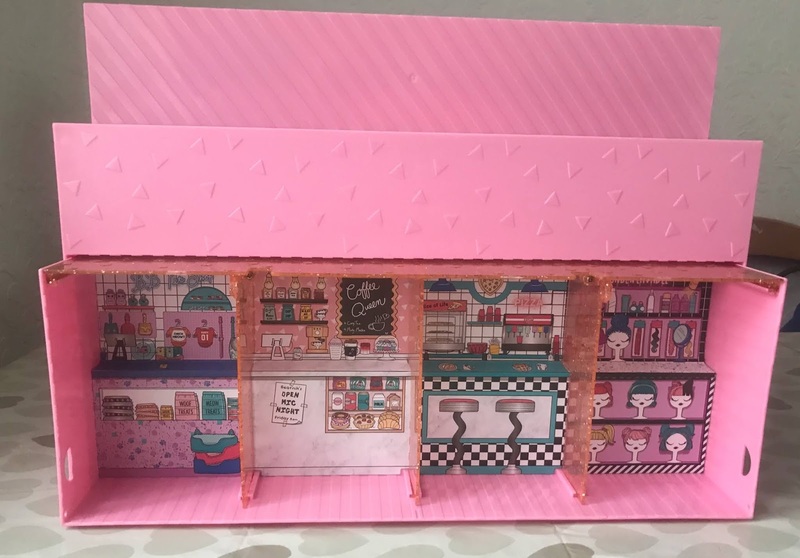 Inside the box, there is the Pop-Up store, which you can use as a store with different shop compartments that you can play with the L.O.L dolls in, there is a pet store, hairdressers and coffee shop and pizza shop for the dolls to explore. It is great for children to play with their L.O.L dolls, making up games and having fun. The set also easily turns into a display case, it can store over 50 dolls and accessories, perfect for keeping a collection all together. There are stands with little feet holes that the L.O.L dolls can stand in, which stops them falling over. At the back of the set, there are little compartments where you can put all the small accessories to keep them safe. So no more losing dolls or teeny tiny shoes anymore. 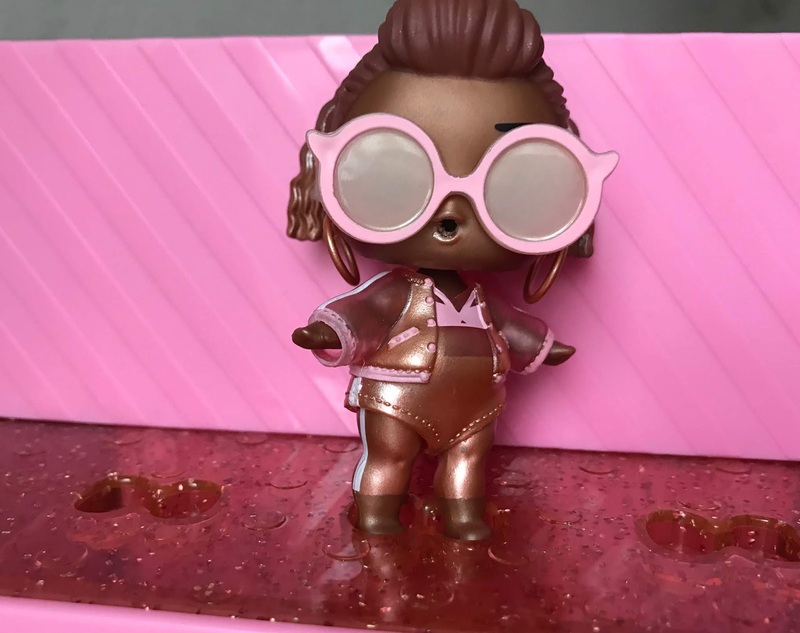 Inside the set, you will also find a surprise exclusive L.O.L doll, which is in a blind bag in one of the compartments. Sophia was super excited about this, even more so when she found more blind bags with the doll's accessories hidden somewhere else in the playset. 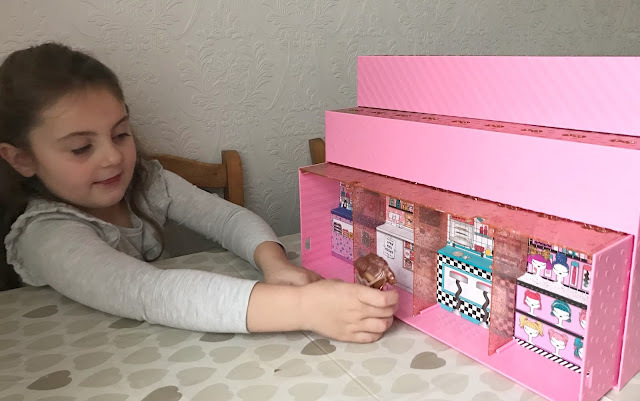 Sophia has spent hours playing with this set since she got it, she loves playing shops with her L.O.L dolls and we have found it so useful for storing all of her L.O.L toys together and displaying them in her bedroom away from her younger brother. 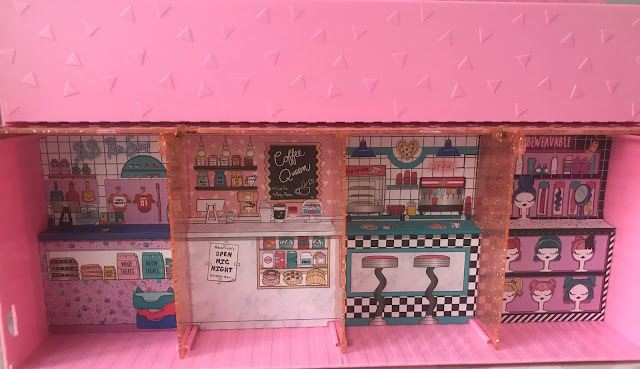 The L.O.L Surprise Pop-Up Store is priced at £39.99 and I personally think that it is worth the money as you not only get the playset/ storage case but you also get an L.O.L doll too which retail at around £11. If your child has asked for L.O.L Surprise things this Christmas then I would recommend this set as it is a lot more affordable than the L.O.L house and my own daughter really does enjoy playing with this toy. 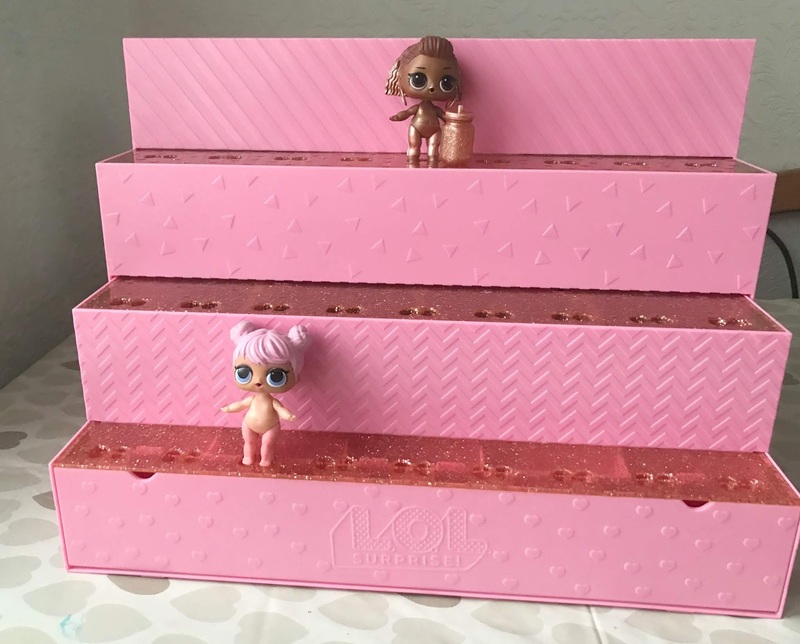 I personally love that it doubles up as a storage case so that all the L.O.L Surprise toys are kept together and we don't have to hunt for missing clothing items or bottles in the toy box. You can buy the L.O.L Surprise Pop-Up Store Playset from leading toy retailers such as www.smythstoys.com Argos and Amazon now. Disclosure I was sent this L.O.L Surprise Pop-Up Store for the purpose of this review, however, all opinions are my own. Thank you for commenting I read and reply to every single one. Newcastle Family Life is a North East based family lifestyle blog covering days out, meals out, travel, reviews, recipes, wedding planning & snippets of our family life. This blog is written by mum of three Lindsay and features my other half Lee, teenage daughter Chloe (16), daughter Sophia (5) and son Jacob (4). We also have a crazy ginger cat called Marmalade. Copyright Newcastle Family Life 2014 - 2017. Powered by Blogger.